Siti Hajar Bt. Che Ahmad is a lawyer since May 13,1993 currently practicing in Yasmeen Hajar & Hairudin, Kangar branch, Perlis. You may reach Siti Hajar Bt. 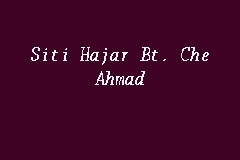 Che Ahmad at 04-9766004. Siti Hajar Bt. Che Ahmad worked in YASMEEN HAJAR & HAIRUDIN before and together, they had handled many cases that hear by Mahkamah Rayuan Putrajaya. Siti Hajar Bt. Che Ahmad works as a lawyer for more than twenty-years.